Microsoft announced a moment ago that it has released a preview version of the "next generation of Skype" which changes the software dramatically. Released initially only for Android, but promised to land for iOS, Windows and Mac OS X later on, the new Skype Preview app is all about creating, playing, sharing, and "doing more" with the people Skype users care about according to Microsoft. Note: The Skype Preview for Android is only available in the following countries right now: United States, United Kingdom, Australia, Canada, Philippines, and Pakistan. Microsoft describes the new Skype in the following way in the introductory paragraph on the Skype blog. Rebuilt from the ground up, the new Skype vastly improves the ways you can connect with your favorite people and, of course, chatting is front and center. We’ve made group chats more lively, expressive, and—most importantly—personalized, so you can chat the way you want. 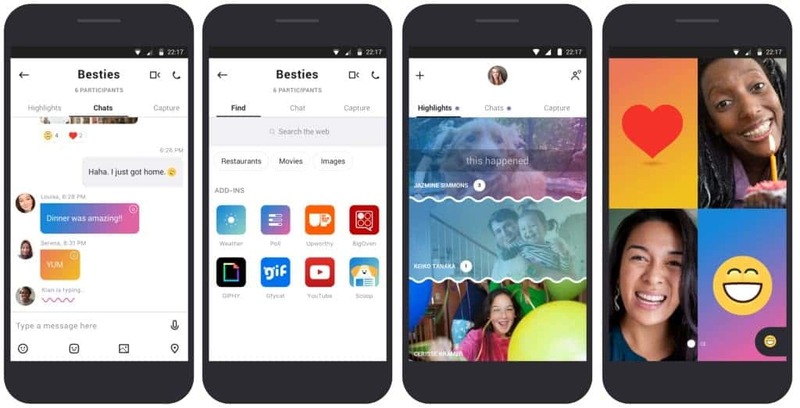 The new features that Microsoft touts are options to pick a color to customize Skype, the new emoticon reaction feature in chat or video calls, and the new highlights feature which allows you to create a highlight reel of photos and videos, and easy sharing. To post a Highlight, swipe to access your camera, take a photo or video, then post it to your Highlights or send it directly to your contacts or groups. Once you post a Highlight, your friends and family can react to it with emoticons or by jumping into a conversation. There is also the new capture feature which opens the camera right away when you activate it. You may use it to capture photos or videos, add text to them or put stickers on them before you share them with others. Another new feature is the find panel which is supported by add-ons and bots to pull information from various sources. Examples given are chatting with the Expedia bot to check flight times and pricing, pull ticket pricing and seating options from the StubHub bot, or weather forecasts. With the ability to connect to your favorite businesses and brands from within the app, the simplest conversations can pave the way to lasting memories. Here is a video by Skype that promotes the new version of the application. The new Skype is a major change when compared to the previous offering. It looks from the outside as if Microsoft picked popular features from popular messaging and social apps and services, and added them to Skype. It remains to be seen how well the new features are received by business customers, and older Skype users who use Snapchat and other apps of its kind less. Now You: What is your take on the new Skype direction? Skype has long had dreams to morph into something bigger than what it is. I have limited cellphone minutes but unlimited cell data, so I use Skype for outbound calling through one of Skype’s paid plans. Why don’t I post a status update Skype? Because I don’t use Skype for mindless chatting but instead use it to get work done! Perhaps if Microsoft spent time on developing new products instead of copying what already exists and focusing on eye-candy UI updates, they could get their stock price up to $1000 like Google or Amazon instead of the $60-70 price it is hovering around these days. ctrl+f: encryption – not found, not interested. Obviously, with encryption some of those new features wouldn’t work, because the online bots have to read your messages. To each their own, I guess. I find Wire to be a pretty solid encrypted Skype alternative. I run Puppy Linux, and since discovering Wire about 4 months ago, it’s all I and my family use now. Especially being cross-platform, with desktop clients and a web one, too. I regularly correspond with relatives and friends in the States and Canada using this, from here in the UK. I’d recommend Wire to anybody. The AppImages run perfectly, no matter what distro you’re using. I guess it’s a no-go for Linux? Linux has not been mentioned. Not a fan of the direction, and I don’t think this obvious attempt to draw in younger users is going to pay off in the way Microsoft want it to. What MS should be focusing on is tidying up their social applications: Skype, Skype for Business, Microsoft Teams… why can’t it just be tidied up and merged all into one? Because that would make sense? I’ve heard there are substitutes for Skype that work properly and perhaps one or more might not be aimed at children or teenagers. If so, I’ll even take it on Windows, Mac or Linux because this new Skype looks like another Microsoft bad idea. Jozsef, just type “Skype alernative” into your browser search box and you will be amazed at the number of sites which have alternative apps to download. Most of them are free. Another pointless redesign from hipsters in la-la land. I use either LINE or Signal for video chats. Both are free, offer encrypted communications and only require phone nunber registration. Samsung installed Skype as part of its bloatware package on my Android phone, but I’ve disabled it along with the rest of the junk. I’d rather get rid of them altogether but it’s not possible unfortunately. Under Windows 10 CU x64 Home on a laptop I use Skype 7.36.0.101 because it provides the capability to use the DejaVu Sans font I installed from Sourceforge. Its visibility is unparalleled for clarity to my ageing eyes, and it is my system font as well. I primarily use Skype for desktop IM, and I hope Microsoft does not deprecate this version in its frantic effort to gain market share.